The findings suggest there is some difference between smartphone and tablet news use when it comes to reading longer stories. But the behavior is occurring on both devices to a degree. Twice as many tablet news users regularly read in-depth articles on their tablet as do smartphone news users, 21% versus 11%, and 19% of tablet users even do so daily. It does appear that compared with a year ago, the current, broader population of tablet news consumers may be reading long-form less often than the earliest adopters, of whom 42% said they did so "regularly." But, that fall-off largely disappears when the timeframe is broadened out to those who "sometimes" read long articles. 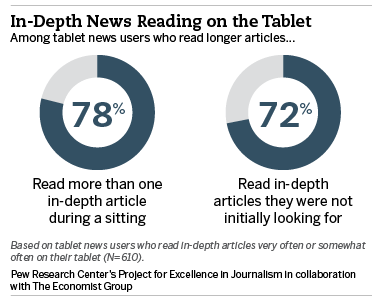 Another 52% of tablet news users "sometimes" read in-depth articles on their tablet, bringing the total to 73%. An even larger group of people read long-form news on their smartphones at least sometimes, 62%, which brings that total also to 73%. Tablet news users in particular appear to be a relatively engaged group. 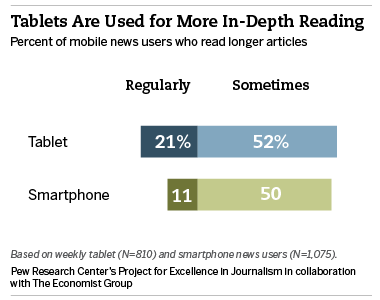 To begin with, even when just checking headlines, tablet news users often end up reading full articles. Nearly seven in ten, 69%, end up reading one or more articles at least a fair amount of the time, including 17% who do so almost all of the time). And looking at the three-quarters of tablet news users who at least sometimes read in-depth articles, the majority read more than one article in a typical sitting. About six-in-ten (61%) read two to three articles in a sitting and another 17% read four or more. And these are often articles they did not set out to read. Close to three-quarters, 72%, say they read in-depth articles that they weren’t looking for at least somewhat often (including 17% who say that is very often the case). We also find that much of the long-form reading of news on tablets is the kind that is done to satisfy personal curiosity rather than professional need. 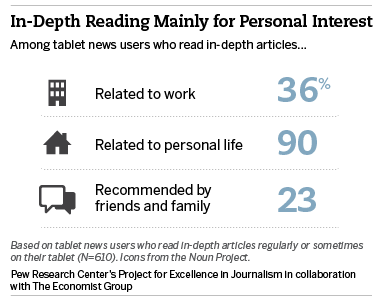 More than half of tablet news users, 56%, say most of the in-depth articles they read are for personal interest versus just 6% who say most of them are for work. That does not necessarily mean it is social reading, however. Only 3% say most of the longer articles were recommended by friends or family (20% say some were and 38% say just a few of them were). Android users are more likely to read news that was recommended to them from friends or family. A third of all Android news users, 32%, say some or most of their news comes to them this way (including 38% of Kindle Fire owners), compared with 19% of iPad users. We also probed, in the survey, where people go when they want to read longer articles. For most of their long-form reading, people have regular sources that they turn to. 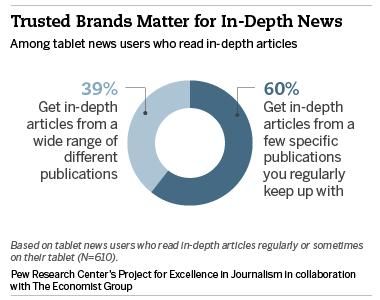 Close to twice as many tablet news users say the in-depth articles they read tend to come from a few specific publications as come from a wide range of places (60% versus 39%). iPad users are more likely than Android users to get in-depth articles from a few trusted publications, 67% versus 54% of Android users (and 52% of Kindle Fire users specifically). The survey also found that people turn to these sources often. Fully 90% of those who usually turn to a few news publications for reading longer articles do so at least weekly; almost half, 45%, turn to them daily. The news brands that people turn to on their tablets also tend to be those they turn to on other conventional computers. Nearly two-thirds, 63%, tend to also turn to these publications via their desktop/laptop. The numbers drop, however, when it comes to smartphone and print. Just 30% of adults go to the same sources on their smartphones as they do on tablets, and just 25% said they go to those same sources in print. As news organizations move toward promoting cross-platform digital subscriptions, we may see more effort to drive consumers who get news on one platform to also connect with that outlet elsewhere. Another question that some publishers have wondered about on the tablet is whether people will read back issues-particularly of magazines. If the physical print publication is not stacking up on the nightstand or coffee table-but rather is filling up out of sight inside the digital device, will people ever read back copies? And if not, does that reduce the value of a publication for them? The findings show that even for this expanding population of tablet owners, 28% read back issues, down somewhat from 38% in 2011.